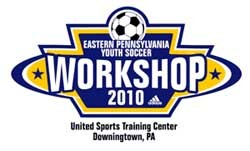 The 24th annual Eastern Pennsylvania Youth Soccer Association (EPYSA) Workshop will feature a Q & A session with Philadelphia Union CEO Nick Sakiewicz, an autograph session and on-field demonstration by Philadelphia Independence players, and lots of workshops with coaches from the youth, college and professional level as well as vendor displays. The workshop will take place Saturday, March 6th at the United Sports Training Center in Downingtown, PA, from 9 a.m. to 4 p.m. Prior registration online saves you $5 off the day-of price of $15. Clarence Goodson, the defender who plays with IK Start in Norway, has been added to the U.S. training camp roster ahead of the Feb. 24 friendly against El Salvador. Soccer By Ives and Match Fit USA report that Charlie Davies has returned to French club Sochaux to continue his rehabilitation. Hiddink, Wenger, the number one rated soccer soap opera and today’s Champions League match-ups after the jump. In related news to yesterday’s announcement that the US will play Turkey at Lincoln Financial Field in their last warm-up match before the World Cup, Guus Hiddink has been confirmed as the new manager of Turkey. Now finishing a stint at Russia and formerly of Australia, South Korea, the Netherlands and slew of club teams PSV Eindhoven, Real Madrid and Chelsea, Hiddink will takeover at Turkey in August. England The Brave John Terry returns, hand in hand with his wife, to England. Isn’t that sweet? In related news, Wayne Bridge is expected to announce whether or not he will retire from international duty with England this week. This is of special interest to England supporters after Ashley Cole had his ankle broken by Landon Donovan in Chelsea’s recent loss to Everton. Just to keep this soap sudsy, the English tabloids are all a’bubbly with stories of Ashley Cole’s alleged affairs. They’ve got, gasp, text messages and, gor blimey, photos! Today’s Champions League match-ups: Porto v Arsenal at 2:30pm, Bayern Munich v Fiorentina at 5pm.